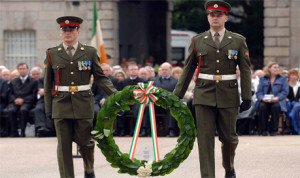 “It is fitting that we remember here today all those Irish men and Irish women who died in past wars or on service of the UN,” said Taoiseach Enda Kenny. He was at one of the six annual National Day of Commemoration ceremonies, held yesterday (Sunday 12 July) to honour the dead. Rabbi Zalman Lent prayed for the ‘valiant and upright’ men and women, and spoke of the sacrifice of those who served fought for justice freedom and the dignity of the human race. The Catholic and Church of Ireland Archbishops of Dublin, Diarmuid Martin and Michael Jackson, took the podium together. They remembered and honoured all those Irish men and women who gave their lives in past wars and in service of the UN, and prayed for loved ones. Rev Brian Anderson, President of Methodist Church in Ireland, said that everyone was gathered to remember individuals “and in doing so express a nation’s thankfulness for those who laid down their lives in the service of this nation to give us the freedom we live in today. Rector of Russian Orthodox Church in Ireland Mikhail Nasonov chanted his prayer that God give rest to the souls who have fallen asleep in a place of peace. The Right Rev Dr Ian McNie, Moderator of the General Assembly of the Presbyterian Church in Ireland read from Ephesians and referred to putting on the full armour of God and a readiness that comes from gospel of peace. Sheikh Hussein Halawa, Iman of the Islamic Cultural Centre chanted his prayer and in English prayed: “Our lord wipe away every tear and relieve us every from fear” and “permit your guidance to be revered all over the world” and that this country and its people would be saved from all the evil. The National Day of Commemoration ceremony in Dublin was attended by the President, the Taoiseach, the Government and the Council of State, as well as members of Dáil and Seanad Éireann, the Diplomatic Corps, the Judiciary and Northern Ireland representatives. The next-of-kin of those who died in past wars or on UN service and a wide cross-section of the community including ex-servicemen’s organisations, as well as relatives of the 1916 Leaders, were also present. After the multi-faith service of prayer, the President laid a wreath on behalf of the people of Ireland.